Industries are well aware of the issues and risks that drones pose on public safety. Few incidents made headlines like the one at Gatwick Airport, that incident prompted many security professionals to consider drone threats and deploy drone detection. Those companies and organizations that have implemented drone detection systems are logging issues daily. 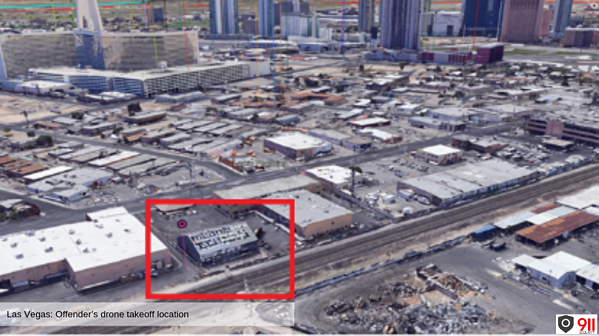 In this case study, we are diving into the data collected from a drone detection system installed near McCarran International Airport In Las Vegas, Nevada. Late December 2018, 911 Security deployed AirGuard, an array of sensors with the capability of remote ID and ability to track various models (or brands) of drones in real-time. 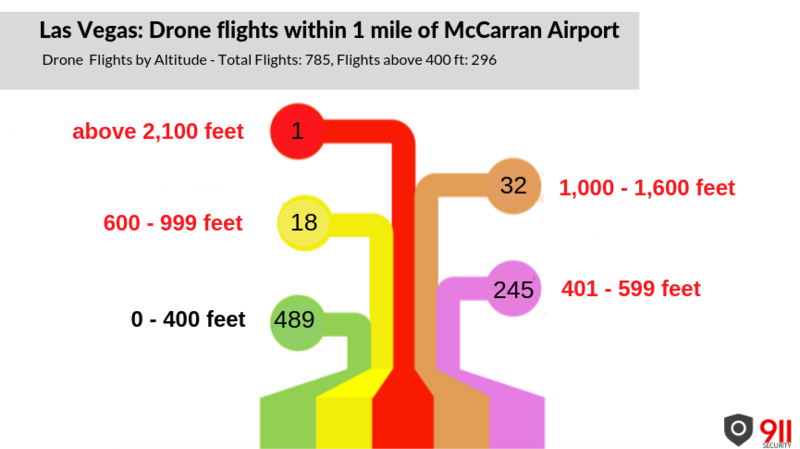 Once AirGuard was installed, our system tracked and recorded an average of 50 drones a day within a 2-mile Radius of McCarran airport. 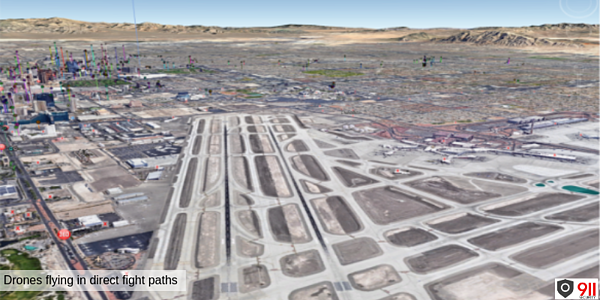 The Las Vegas strip is located approximately one nautical mile from the McCarran airport. Since the Vegas strip is inside the 5-mile “No Fly Zone,” each of those flights violated federal regulations. 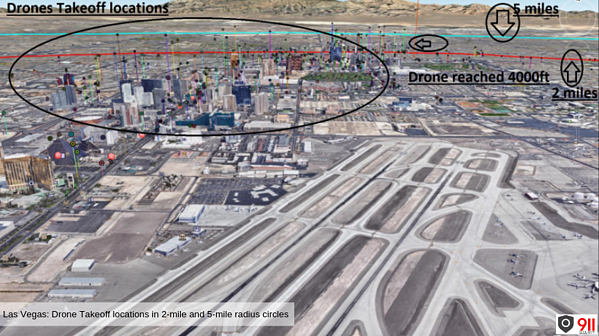 After collecting and recording the data, we layered the drone data over McCarran airport coordinates in 2-mile and 5-mile radius circles which included airport flight landing paths. The results were shocking, 785 drones flew within one mile of the international airport in the four week period. 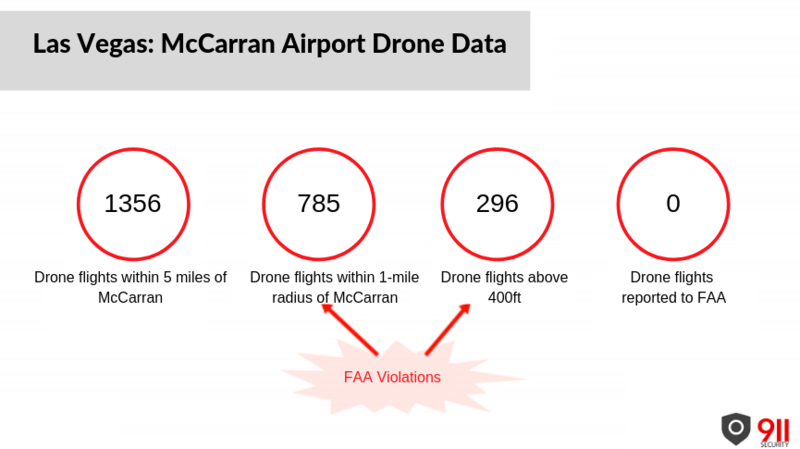 Upon analyzing the data further and looking at drone flight altitudes, we learned that nearly 300 drones flew over the allowed range of 400 ft and one drone flew over 2,100ft. The city of Las Vegas case study got more interesting when a YouTuber and a drone pilot, going by the nickname BrandonON, uploaded youtube videos with footage of his drone flying over various Vegas landmarks such as: casinos, the famous Stratosphere Tower, HWY 10 and over the Vegas strip. The video, uploaded on January 28, 2019, was flagged by several casino property owners. These owners were aware of our system in their area and reached out to us for help. Since the Remote ID is still in concept stage and of course we don’t have access to the FAA drone registration database, we used our solution to capture the unique identifier number combined with some old school detective work to find the pilot. Another challenge during the investigation is we didn’t know exactly when the videos were taken. It would have been too time-consuming to check every flight and compare it to the drone from the video. 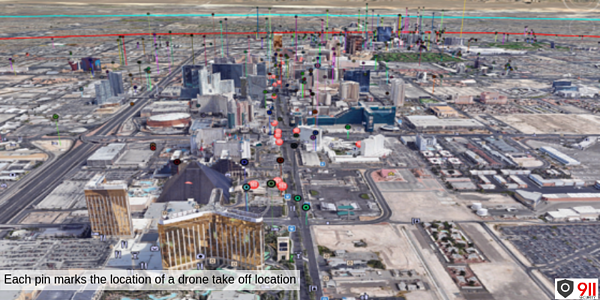 Instead, we mapped all drone flight take-off locations in Vegas. Afterwards, we compared those to the drone takeoff location in the video. Minutes after analyzing this data with Google Earth, we were able to identify the takeoff position and the drone’s unique identifier number. Using the unique identifier from the pilot’s drone, we were able to track all of the pilot’s flights in Vegas and in the other cities where we have AirGuard deployed. The pilot was later identified, and information about the drone flight was shared with the FAA. Remote ID, when it becomes implemented in the US, will function similarly. It will allow airports, stadiums, private businesses, and law enforcement to monitor the airspace for unauthorized access and track drones using the unique identifier number. Until then systems like AirGuard can provide the tools needed to further secure the airspace for many different environments.